> Westbury was THE place to see them on this tour. Tis not about the lights. No more than 60 feet from the stage. Was there. Had a ticket in the absolute last row and never bothered going there, so spent the night wandering the perimeter so I could watch the band on different numbers. The crowd loved this show. I think they would have hung out all night if the band kept playing. Someone should really tell Chris that he is past the point of putting on the stretchy pants. I thought he performed well, especially on the Drama songs. Had never seen Tempus Fugit live, so that was a treat. He seemed very happy to be playing, which was nice. I thought Oliver was good, but he seemed unwilling to stray too far off the beaten path carved for him by his predecessors. I thought his best effort was Starship Trooper without a doubt. At one point, I was in the very back behind the booth in the last row, and I caught a glimpse of the set list which was displayed on one of the computers in the booth. South Side was supposed to be the last tune of the night, but for some reason they chose not to do it. I was very disappointed by that, since it's a favorite. Overall, I have no major complaints with the set list, although I can do without Roundabout and All Good People after all these years. I would much prefer to see them toss in Perpetual Change, America and/or Heart of the Sunrise. They looked and sounded shot!! See you all in 2009!! If they played this music in the 1970's like they played at this show, this web site would not exist. It's like watching Larry Czonka and Jim Kick play for the Miami Dolphins in 2008. Westbury was THE place to see them on this tour. JY ,to call this show In The Round is like calling a 10 speed bicycle a rocket ship. this show was as close to YES in the round 1978 as the farthest star in the solar system is from earth!!!!!!!! The first 2 minutes of the 1978 shows are better than the last 5 tours put together. The round stage at Westbury looks like the size of a quarter. 1978 and 1979 had an amazing Round set up with an amazing array of sight and the best sound ever! I have more lights in my bedroom than the Westbury Theatre has. The NYC show had their normal light show that they couldn't use at Westbury, but even that was lacking. No biggy, just concentrate on the music. That's what we are there for, regardless of Howe cheesy these versions sound. Parallels, which has some of my favorite guitar was a non factor. What should have been amazing, you couldn't hear. Steve's guitar could not be heard on that song. Very frustrating. I enjoyed this Yes show. I am a veteran of about 60 Yes and related concets and this one did not disappoint. I have seen Yes from similar seats (3rd row) at Nassau Coliseum on the Drama tour and ABWH tour. I also had the privelge of seeing them at Radio City from the 4th row. Seeing Steve play is wonderous!! I could listen to him play almost anything and enjoy it. Chris is always the showman and did not disappoint here. Alan is Alan -- I prefer Brufford but Alan is great also. Oliver Wakeman looked so serious at all times. Hopefully when he continues playing he will loosen up a bit. I thought he performed admirably. He is certainly not the virtuoso that his father is and has big shoes to fill. I am certain that he feels the pressure of his father's legacy. Noone plays the atmospheric stuff as well as Rick (Close to the Edge -- I get up I get down for example) but he was competent. Benoit: Although he is not Jon Anderson he sang very well.I was amazed at the way he sang Onward and Close to the Edge. Starship Trooper was one of the best versions I have seen them do. Roundabout was sloppy and unimpressive -- then again, I have about had it with that song. I have seen Yes in several foreign cities and other American Cities over the years. I will not go and see this particular tour again. Having said that, the concert is enjoyable and should be seen by all yes heads. Steve Played Winter (Vivaldi) Ram and Clap. If anyone can confirm the setlist, particularly what Steve Howe played in his solo, your host would appreciate it greatly. With that being said (and despite the obvious sound problems where we were), I thought that it was an excellent show. The setlist was everything I expected it to be and there were some truly magical moments. Having missed the Drama tour after seing them@MSG on both the 1977 & 78 tours "In the Round", it was a great thill to finally hear Tempus Fugit live though some might say that it was a bit sloppy. Onward was just downright beautiful, Astral Traveller rocked and CTTE was bascially flawless and I'm getting goose-bumps as I type this over the memory of it. I was SO psyched for Parallels but, unfortunately, Steve's guitar was MIA for the first half where I was sitting but the sound for the second half of the song improved greatly and so did my enjoyment of the song itself. AYAI was magical, 'nuff said. Machine Messiah rocked hard, another great revival off a seemingly forgotten album in the catalog and kudos to the current incarnation for pulling out the musical nuggets such as this and the aformentioned songs. Soon was totally ON and Starship Trooper ended the set with style. Benoit David did IMHO a great job though he seemed to be undermiked all night long and his best songs to my ears were Onward and Soon, the songs where he didn't have to "battle" the rest of the band for his place in the mix. 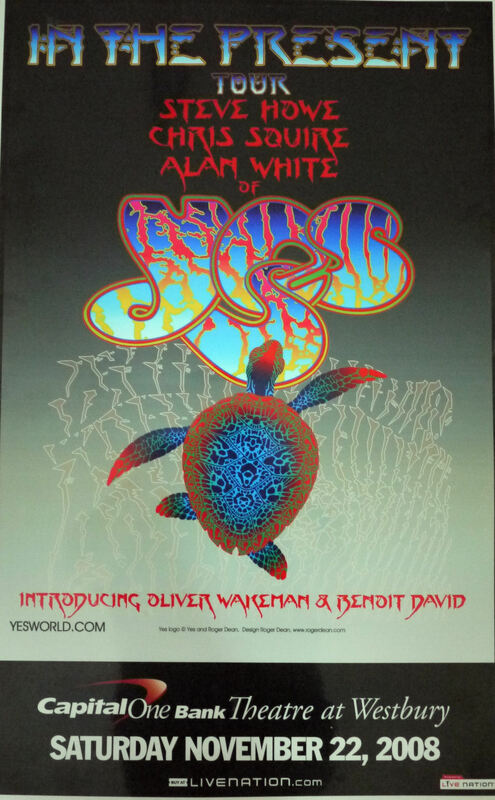 Oliver Wakeman was kind-of playing "by the numbers", he did well enough but really didn't add anything to the songs as have his (many) predecessors but I can only imagine that just replicating the previously-recorded keyboard parts were enough of a chore. Howe, Squire & White were rock-solid all night long though they, too, didn't really add as much to the songs as they have in prior tours, probably to make it as easy as possible for the "new kids on the block" so I can understand why they kept it basic though, once again, the recorded parts are probably (to this non-musician) super-difficult to replicate on their own. Despite the sound problems encountered, a very worthwhile and enjoyable evening and one that I wish I could do under different aka seating circumstances. Aliens, Parallels, Onward) which was very much appreciated. It was like 1978 all over again. Except that one is no more than 60 feet from the stage. We were in the 9th row, about 25 feet back, not quite half-way. The mix was wonderful, nice & clear, not too loud, good balance. Mr. Howe & Mr. Squire were in excellent excellent form, as always. May they live & continue playing Yes music forever. Mr. White was solid also, as always. Was nifty being able to watch him from behind. Didn't miss Mr. A at all. without the attitude & ego of their old singer. stay together for awhile & keep touring. Mr. "to the sun"
should just enjoy his retirement. train-wreck at the couple of spots, but they got through. The rest was marvelous, simply marvelous. Bring back "Southside" &/or "Heart of the Sunrise" & drop "Aliens". material. Really can't complain at all. I took about 40 minutes of video with my little digital camera. bit of Wurm too, but was running out of memory on the cam by then. Came out surprisingly well, even the audio. Amazing little device. Great view of the round so close to the stage. If I decide to upload to youtube, will provide some linkage. Soundchaser: I think you're right that the "location in the hall determines all" when referring to the mix. I got real lucky at Westbury and real unlucky at Hammerstein. Also, on the lights, I must confess a bit of ignorance. My first show was 1984 and it is definitely the case that lights have been a lesser part of all the shows I've seen (about 25 shows) with sound being a larger part. Finally, on Benoit's age. I'm 42 also, so I guess I dared to think of that as being young! No really, if you watch him closely (and I saw him from the second row at Hammerstein) he's got a youthful way about him that's charming. I'm not saying it's a bad thing. >but I like how he made most songs his own and I also like how he enjoys the stage. You DO know that Benoit is 42 years old, right? Hardly young and inexperienced--just not Jon. BTW, I think he's doing an excellent job handling lead vox and he looks quite comfortable sharing the stage with the older guys. mater of soul, you say yes is not known for their light like other groups. are you kidding me!!! 1972, 1973, 1974, 1975, 1976, 1977, 1978, 1979 - incredible light shows during those tours. with 1976 being the best ever!!! also the Hammerstein in NYC sounded better than Westbury. Their mix is so inconsistent it really depends where you're sitting. mater of soul, you say yes is not known for their light like other groups. are you kidding me!!! 1972, 1973, 1974, 1975, 1976, 1977, 1978, 1979 - incredible light shows during those tours. with 1976 being the best ever!!! I was there for the Westbury NY show and they did play OOaLH. No Heart ot the Sunrise. Please try not to post in ALL CAPS. Thanks. I was in the 12th row in section D right behind the sound board. The sound was absolutely superb. I was in the second row at Hammerstein and the mix was way off (still enjoyed it though because of proximity). Yes is not known for lights compared to other groups and the lack of lighting (which I agree was lacking) is not uncommon in my 25 years seeing them live. The crowd was WAY into it and this helped bring them up several notches ESPECIALLY STEVE. Steve added some really cool fills to some of the solos and I really enjoyed that. Oliver is a big-time cool cucumber and that's just the way it is. I can't imagine him leading his own band. He's not Rick. The lower energy he brings makes the songs a little flatter at points, but we're splitting hairs somewhat. Now -- I like Benoit, and I wasn't sure I would. He's also young and a bit inexperienced, but I like how he made most songs his own and I also like how he enjoys the stage. There were a few moments where he looked a little lost, but recovered quickly. None of this is to take anything away from Jon whom I adore. There are plenty of lineup changes that moved the band forward over the years from Moraz to Rabin to Horn to Sherwood and I personally see the Benoit David experience as a wonderful turn in the road and I'm glad I got to see Yes now. If they tour again in 2009, great, but this was a very nice tour. Saw Yes last night at Westbury. Show was great!I sat behind one of the sound guys in the front row. This was my 11th time seeing Yes/ABWH but my first time in the round. The Drama tracks were great. Benoit sounded a lot like Jon. Even though he forgot part of a line in CTTE, over all he was great. Steve had great energy ,jumping up and down near the end of Starship Trooper. Alan was full of energy as usual. However Oliver seemed not to smile much or have much emotions. He seemed to do a fine job playing the songs. Concert ended with one of my favorite live versions of Roundabout. Over all you need to see the Guys on this tour even if John isn't with them. You may never see this band live again. Judging by the audience response, if you took a poll I would anticipate 95+% loved the show.There was nothing wrong with the sound, lighting, or mix. Wakeman was fine........could he have been more animated?......sure, but nobody was there to see him in particular and his playing was fine. While walking to my car after the show I heard nothing but great comments from the crowd leaving the venue. This was an outstanding performance. Wow Yesdoc, how we experienced things so different. Light show?...Right, just the standard Westbury lights...so what? You want a light show, drop a hit and shut your eyes. I prefer to see Yes. Poor show....Poor sound...Oliver is terrible..How did he make a living prior to this? You are Robotic, whats up Fish?? CALL IGOR OR TOM BRISLIN FOR HELP!!!!!!!!!! SOUNDCHASER: THE ABOVE PRETTY MUCH SUMS IT UP. TO ME IT LOOKS LIKE OLIVER LOOKS AT THE CROWD WONDERING WHY IDIOTS CAME TO SEE THEM PLAY THESE SONGS, THAT HE HAS NO CLUE HOW TO PLAY IN A TIRED LOUSY WAY, WITH NO SOUND SYSTEM, LOUSY LIGHT SHOW! I WAS AT THE SHOW IN NYC. THAT SHOW WAS MUCH BETTER WITH THE REAL LIGHT SHOW, BUT IT WAS STILL LACKING FOR A BAND AND MUSIC OF THIS MAGNITUDE. 1971-1979 $4- $8 - GREATEST SHOWS EVER, GREATEST LIGHT SHOW EVER, GREATEST , MIND BOGGLING PLAYING OF ALLTIME. $2008 - $80 - TOTAL CRAP. BENOIT DAVID DID AS GOOD AS HE COULD. THE SHOW COULD HAVE BEEN SAVED A LITTLE BIT IF THE GUTAIR SOLOS AT THE END OF SIBERIAN KHATRU AND STARSHIP TROOPER (WURM) WERE ALITTLE LONGER. I DON'T EXPECT IT TO BE LIKE 10/28/78 OR 5/5/79, BUT AT LEAST EXTEND THEM TO MAKE UP, A LITTLE BIT ANYWAY FOR THE LACK OF EVERYTHING!!!!!!! ELSE. IT'S ALL ABOUT THE MONEY. THEY DON'T CARE HOWE BAD THEY SOUND, LOOK, PLAY OR RUIN THEIR SONGS. STEVE'S GUTAIR WAS WAYYY TO LOW DURING PARALLELS. 1,000,000 LIGHTYEARS BELOW THE 1977 VERSIONS. THERE IS NO EFFORT. THEY CAN DO WURM STANDING ON THEIR HEADS, EATING LUNCH AT THE SAME TIME. WESTBURY? THEY COULD HAVE BEEN PLAYING ON MIAMI BEACH FOR ALL THEY KNEW. NOT NIT PICKING. JUST STATING THE FACTS. THE LAST YESSHOW THAT WAS A REAL LIFE CHANGER WAS 6/30/79. THE LAST TORMATO TOUR SHOW. CASE CLOSED. This show was somewhat dissapointing. I felt like they were for the first time out of there element. The first set was slow and draggy, Benoit forgot the lyrics to close to the edge and chris squire can't sing the appropriate harmonies anymore. Even though the second set picked up it still felt like this whole thing was thrown together. Some good moments were And you and I and Starship Trooper. Jon Anderson's presence was certainly missed. I hate to say it but maybe these guys should finally throw in there towels and let the legacy live through albums and tribute bands. Btw Steve Howe was the rock throughout the show as usual never made a mistake always on the ball. Great show as expected. The house was full, and a lively audience was appreciated by Yes. The setlist was the same as most of the other shows, and by now they are on fire! Benoit and Oliver are excellent additions. Boy can that guy sing, and he has a great stage presence. Chris, Steve and Alan all look great and are on top of their game. It is nice to hear songs not normally played when Jon is touring with them, which is why this tour is special for me. The crowd was a great mix, from 2years old to 80 plus. Yes has been around for most of our lives, and by the look of things tonight, the music will be around long after we are gone. Thanks guys for a wonderful evening! I can't wait to order my Tormato, Drama and Going for the One CD's on Amazon.com tomorrow! Tremendous performance at Capitol One Theatre, great from beginning to end. Highlights included Long Distance Runaround,All Good People, Close To The Edge, and a wonderful performance of Starship Trooper. Benoit David was much better than expected. All in all, an excellent performance. very clear, the venue's PA, great show...Yes in The Round! I HAVE SEEN YES MANY TIMES BUT TONIGHT AT WESTBURY IT WAS THE FIRST TIME I COULD SEE AND HEAR EVERY NOTE. THE BAND WAS JUST EXCELLENT! THE LONG ISLAND CROWD SHOWED THEIR APPRECIATION AND THE BAND RESPONDED IN A BIG WAY. CHRIS AND ALAN WERE SO GREAT AND STEVE WAS ON FIRE. AND YOU AND I WAS A GREAT HIGHLIGHT! OLIVER AND BENOIT WERE ALSO GREAT. MISSED JON. BEST WISHES TO THE BAND. GOOD LUCK TO JON. THANKS!!! Chris and Steve, if you read this please .Heart of the Sunrise and South Side of the Sky for encores tonight!! Unless you practiced To Be Over? ?